Normally I have shied away from this dish because of the heavy cream and eggs, but I have made a lighter version of it using Egg Beaters and 2% milk that I thought was better than the traditional method. I have tried the traditional method and you can choose which way you want to make it. 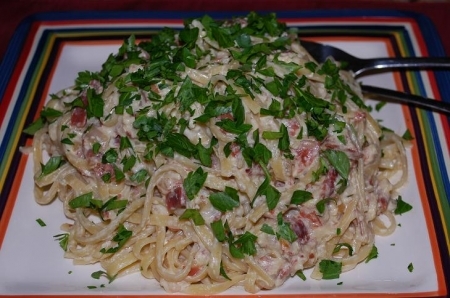 Also you can mix it up by using spaghetti instead of linguini and pancetta instead of the prosciutto I used. I do highly recommend fresh Italian flat leaf parsley, because it really adds a lot of flavor. Fresh basil is not a good substitute – I have tried it! Also this is “Little Chatter” approved – well for one of my “Little Chatters” – Zachary! Serves 4. In a large pot add water and about 2 tablespoons of kosher salt and bring to a boil. Add pasta and cook per package directions. While pasta is cooking make the sauce. In a medium bowl whisk eggs and cream together and set aside. If using the lighter version add Egg Beaters and milk to a measuring cup and set aside. Grate parmesan and set aside. In a large skillet add olive oil and prosciutto and sauté over medium high heat until lightly browned. Add onions and sauté until translucent. Add garlic and sauté for about 30 seconds. The pasta should be done by now. Add the pasta water to egg mixture to slightly temper it. Tempering it will prevent the eggs from scrambling when adding to the skillet. Drain pasta and add to skillet along with egg mixture and cheese and toss evenly to coat pasta. Plate and top with parsley. Try Farnese Sangiovese (Italy), Bogle Vineyards Pinot Noir (Russian River Valley) or Parducci Family Farmed Pinot Noir (California).